National Geographic photographer Steve Winter has made a career out of stalking and capturing the world’s most elusive and endangered big cat. His latest book, Tigers Forever, coauthored with environmental journalist Sharon Guynup, contains the most intimate shots he’s ever taken of the wild feline. Winter traveled to some of the remotest parts of Asia to bag his quarry. Along the way, he and Guynup chronicle their forays into tiger territory and recount the stories of researchers, park rangers, and conservationists fighting to save the big cats, which number fewer than 3,200 in the wild, from extinction. A portion of the proceeds from the sale of Tigers Forever will benefit wild cat-conservation group Panthera’s tiger-conservation program. In an age when the path from birth to professorship is all but scripted, primatologist Patricia Chapple Wright’s rise to the top of her field makes for an intriguing and unexpected tale. 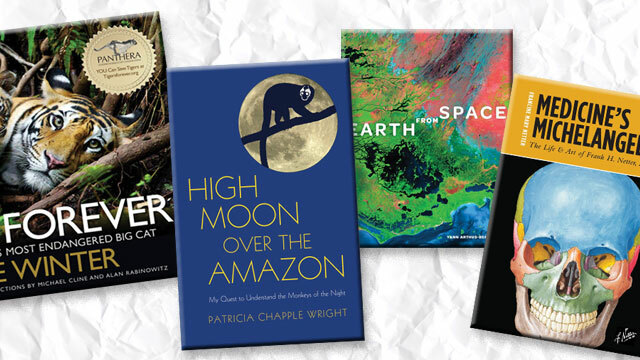 In High Moon Over the Amazon, Wright recounts her unconventional transformation from Upstate New York tomboy to Brooklyn social worker to MacArthur Fellow and one of the foremost experts on the lemurs of Madagascar. And it was all thanks to Herbie the owl monkey (Aotus sp.). Purchased for $40 in a Greenwich Village pet shop, Herbie proved to be a handful for Wright and her first husband, James Wright. The young couple decided to board a plane—with Herbie in a cat carrier—for the Columbian Amazon to find their monkey a mate. Remarkably successful in their quest, the Wrights secured a mate, Kendra, for Herbie, and the budding primatologist took pleasure in observing their nocturnal gamboling about their civilized surrounds. As Wright watched the monkey romance flower, her own marriage began to fall apart. When the marriage eventually ended, Wright embraced her newfound freedom and returned to the Amazon, daughter in tow, to study primate behavior in the wild, spending a year at a remote research station in Peru, where her passion for science solidified. High Moon Over the Amazon is an inspiration to researchers and lay readers alike. Renowned aerial photographer and environmentalist Yann Arthus-Bertrand (or at least his perspective) leaves the atmosphere for Earth from Space, his latest book of breathtaking photographs. With images from NASA and Astrium, a European space technology company that specializes in satellite photography, Arthus-Bertrand shares a lofty point of view that both celebrates the pristine beauty of Earth and documents the seemingly irrevocable damage humankind has wrought upon its home planet. Interspersed with awe-inspiring shots of volcanoes, natural rock formations, sprawling forests, and meandering rivers are poignant images of forest fires, urban sprawl, and shrinking glaciers, each a work of art in its own right. The accompanying text is as informative as the pictures are beautiful. Explanations touch on the landscapes depicted, on the utility of satellite data for research, on the wider environmental issues made clear in the photographs, and most importantly, on potential solutions to the most pressing problems facing our fragile planet. If you’ve been to medical school, or even if you’ve only thumbed through a medical textbook, you’re familiar with Frank H. Netter. In Medicine’s Michelangelo, the first biography of Netter, daughter and author Francine Netter traces the development and impact of the famed medical illustrator’s feverish devotion to painting the intricacies of human anatomy. The son of immigrant cigar-store owners in Manhattan, Netter loved painting from a young age. But urged into a more “respectable” career by his mother, he attended medical school at New York University, did a surgery internship at Bellevue Hospital, and went into practice as a surgeon. The Great Depression made earning a living as a physician difficult, however, and Netter paid his rent by selling pictures to pharmaceutical companies to use in ads at $50 a pop. In 1934, Netter decided to scare off an advertising manager by asking an exorbitant fee ($300 apiece) for five paintings, so he could focus on his medical career. The next day, the ad manager returned to Netter’s office and said he was authorized to pay Netter $1,500 per painting. “I was so shocked that I did not correct him,” Netter wrote in his notes. “The demand for Frank’s sable brush grew faster than the demand for his scalpel,” writes the younger Netter in Medicine’s Michelangelo. Netter would build a body of work—13 atlases of the human body and more than 200 pamphlets—that is unparalleled in the annals of medical illustration. Several color plates and early line drawings in Medicine’s Michelangelo illustrate Netter’s prolific career.